Starting April 30, 2018, landlords of most private residential rental units, from individual landlords to property management companies and realtors who assist landlords in placing tenants, must use the Standard Lease template for all new leases. (eg. owner contact info, etc.) with every lease. 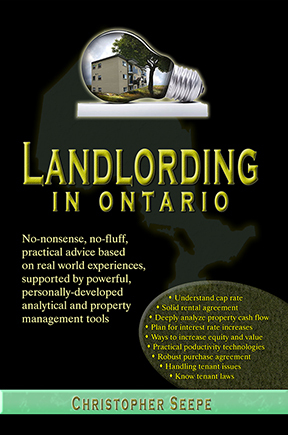 This two-hour video is a recording of a presentation I did on Ontario's mandatory Standard Lease Agreement (SLA), which is now required for most residential tenancies. The presentation discusses details each of the 72 (now currently 78) clauses that I feel are 'missing' from the SLA and which form my Appendix B of the SLA (now totalling 78 clauses). After weeks of trial and error and exhaustive proofreading and editing, I created a fully-editable Microsoft Word fillable form that compresses the SLA down to 5.75 pages (half the original document's size) without changing any content and removing only 'dead space'. Adding my own 78 clauses creates a total of 11.75 pages. Add your standard fillable content (or delete the fillable field and enter your non-changing information (landlord address, contact, etc. ), then protect the document so that your fixed fields can’t be changed. Every word and punctuation mark of the original 14-page SLA government form is captured. Removed massive amount of ‘dead’ space and tightly compressed the text..
- Some items in the standard SLA appear ambiguous or only provide partial (usually tenant-biased) details. The Appendix B clauses are all completely editable. 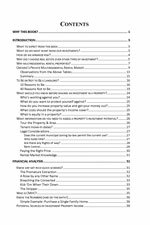 A 20-point, fillable field tenant qualification checklist table is also included. Note: There is one inexplicable limitation: each fillable field can be automatically 'tabbed' to when in the document is in unprotected mode but when it is protected so that only fillable fields can be changed, tabbing stops at check boxes. This is a known error of Microsoft Word which remains uncorrected. The quick workaround is to click the text immediately to the right of the checkbox and the cursor will jump to the next fillable field. Separate Guarantor Agreement included: A guarantor is not a tenant. A guarantor cannot be the subject of an LTB claim. This is why there is no provision for a guarantor in the SLA. A separate, completely editable 2-page MS-Word Guarantor Agreement is included. Separate Parking Space Rental Agreement included: Separating out the parking space from the lease means the parking space is not subject to the RTA or rent controls (NOT COURT TESTED). You can then pass on to the tenants the true costs of maintaining your parking lot such as unexpected extra salting charges. 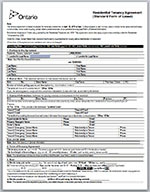 Tenancy Application Form included: Tenant permissions are required for a number of privacy concerns including collecting tenant information from social media, calling previous landlords for referrals, contacting past employers, taking photographs inside a unit, security video surveillance, and the ongoing enforcement of the rental/lease agreement. This field-fillable tenant application in Word format addresses all those concerns and more. This document has not been reviewed or approved by the Ministry of Housing or vetted before a tribunal of the Landlord and Tenant Board. Every letter and punctuation mark in the official .pdf version of the Ontario Standard Lease Agreement has been retained in this Word version -- only the formatting has been edited. It is my understanding that copyright protection applies to the content (text) of a form, not the formatting of one. The fee charged for this Word-version SLA is strictly for this reformatting service - nothing else. You may not share this legal viewpoint, in which case you should stick with the government's .pdf document. The Standard Lease document was also created using Ontario taxpayers' money so the question arises whether the SLA document belongs to the public. In any event, if you choose to use this Word version of the SLA you must obtain your own expert legal advice as to whether removing spaces (that is, formatting) constitutes a change to the document or is grounds for copyright infringement. This is an 'as-is' product to be used at your own risk. 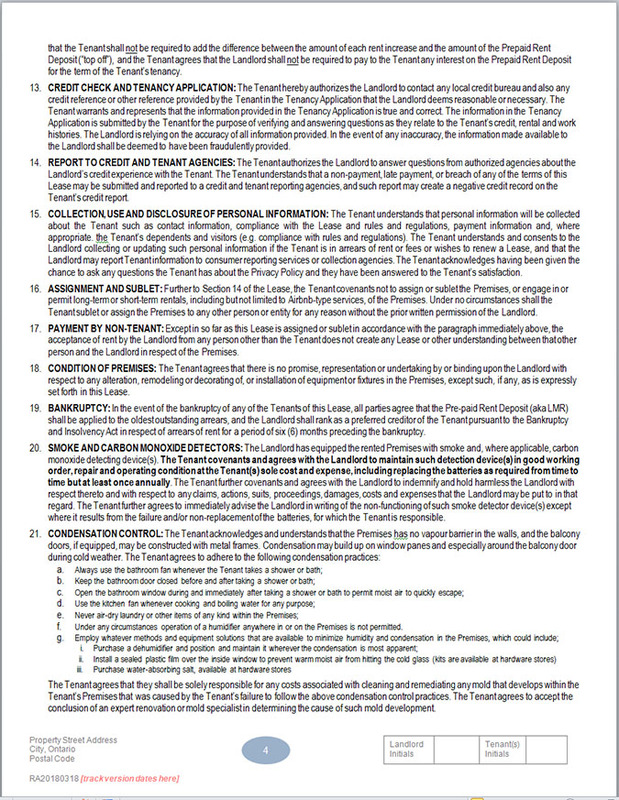 By purchasing this compressed version of the Standard (Form of) Lease Agreement along with the Appendix B clauses and the separate Guarantor Agrgeement (collectively the 'Lease') you understand and agree that the Lease is provided “as is” without any warranty of any kind, and that Christopher Seepe and Aztech Realty Inc. are not legal or financial experts. You warrant and agree that you shall indemnify the aforementioned parties and hold them completely harmless from any and all responsibility of any and every kind that might arise from your use of this Lease in whole or in part. You further understand that you will use this Lease for only the limited-use license you were granted by the terms of your purchase and you agree to not copy this Lease in any form or give it to any other person or entity or otherwise allow it to be copied by any other person or entity except for your personal backup use. A password-protected version may be posted online. If you disagree with any part of this Disclaimer and License then you should not purchase this product. 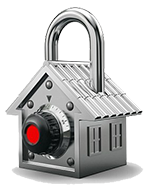 ● Please send an email to me (cseepe@aztechrealty.com) that you will be sending payment for the Standard Lease, the type of licence you want, your full name, company name and phone number. I will then send the MS-Word documents to you via email as an attachment. Please ensure that I have your email address as part of your Interac payment or otherwise send me a separate email stating that you've sent payment.